Our instant messaging system which allows you to talk to people in real time who are signed online to Pan Historia requires that you allow pop ups from www.panhistoria.com. Allowing pop ups at Pan will great increase your enjoyment of the site, allow you to make friends, and get help from our staff. Pop up blockers are necessary on many sites on the web to prevent annoying ads and nasty unwanted pop ups from adult sites. Pan Historia is a safe site and we do not have outside ads or use pop ups for anything but our instant messaging system. Sign into your AOL account. Click once on "Blocking Pop-ups" at bottom-right corner of screen and choose Set Pop-up Control Preferences. 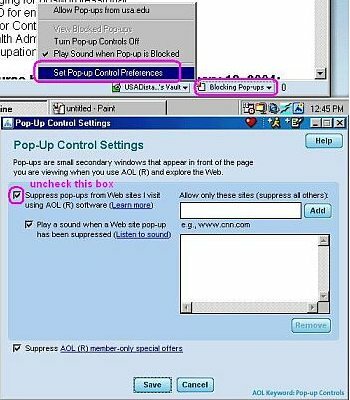 Uncheck box labelled "Supress pop-ups from Web sites I visit using AOL (R) software or add www.panhistoria.com as a site NOT to suppress. Click Save to save your change. Minimize AOL's browser and use Internet Explorer to return to Pan Historia. Look for the button labelled Pop-Up Blocker. Click on it to turn it on and off. The Google Toolbar is an add-on for Internet Explorer. If you have it, click on the Blocking Popups button and it will change to Site Popups Allowed. On FireFox click on Tools off the main menu, scroll down and choose Options. After bringing up the Options settings box, go to the Content section listed which has an image of a globe. You will see a checkbox listed �Block pop-up windows� with a button to the right labeled Exceptions. A dialogue box will appear where you can enter www.panhistoria.com after which just click the allow button. If you have installed Service Pack 2, then you have a popup-blocker in Internet Explorer. To turn it off, click on Tools in the menu, then click on Internet Options. Click on the Privacy tab and uncheck Block Popups. The McAfee Internet Security Suite has a popup blocker and it's part of "Privacy Services" and needs to be off while you're at Pan Historia. Norton's Internet Security (symantec) has a popup-blocker and here's how to turn it off. Click on the Yahoo Toolbar's popup blocker icon option arrow. This arrow is pointing down beside of the popup blocker icon. Click on the menu option "Always Allow Pop-Ups From..."
Locate "panhistoria.com" from the "Sources of Recently Blocked Pop-Ups:" list box. Single click on "panhistoria.com". Single-click the "Ok" button when asked to confirm allowing of pop-ups from panhistoria.com.